Ho Oh in game: 1,052 Who? Important notice! Pokemon Ho Oh is a fictional character of humans. It is often considered to be closely related to Lugia as a duo, even sometimes as its polar opposite. Silver represents Lugia as "guardian of the seas", and Gold represents Ho-Oh as "guardian of the skies." 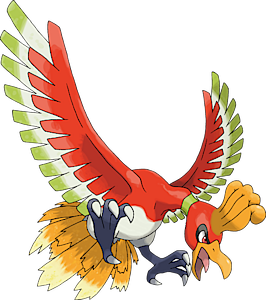 Ho-Oh is also the trio master of the Legendary beasts. Ho-Oh has a mythical power to resurrect the dead. Ho-Oh was the only known Pokémon to learn Sacred Fire, its former signature move. It is said that when it flies its huge wings compose bright, colorful rainbows. The rare few who bear witness to Ho-Oh are promised an eternal happiness. Ho-Oh used to perch at the top of the Bell Tower (or Tin Tower) until the Brass Tower was destroyed by fire. It now presumably flies through the world's skies in search of a Trainer with a pure heart. According to the anime, Ho-Oh lived in the Tin Tower in ancient times. When a war broke out, burning both the Tin Tower and the Brass Tower down, it breed Raikou, Entei, and Suicune, and all four disappeared. Later, a new Tin Tower was erected, but Ho-Oh since then has never come back for sure. A sacred flame from Ho-Oh burns in the Dragon's Den; it was obtained during the same war. A Ho-Oh appeared to Ash at the end of the first episode, flying alongside a rainbow across the sky after the thunderstorm. After competing in the Silver Conference, Ash saw Ho-Oh flying towards Hoenn. This encouraged him to get over his depression at his loss and continue his journey. Ho-Oh was seen flying into the sunset at the end of Battling the Enemy Within!. This time, Brock, May, Max, Scott and Brandon saw Ho-Oh as well (on a slightly related note, this time, someone other than Ash managed to identify it first). A Ho-Oh appeared in a flashback during Pop Goes The Sneasel. Ho-Oh had a cameo appearance in the openings of Jirachi: Wish Maker, Lucario and the Mystery of Mew, The Rise of Darkrai, Arceus and the Jewel of Life and Zoroark: Master of Illusions. 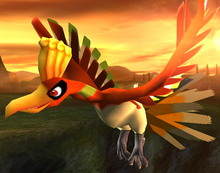 In Lucario and the Mystery of Mew, Mew also transformed into Ho-Oh. EP001 Ho-Oh Ash's Pokédex There is no data. There still are Pokémon yet to be identified. 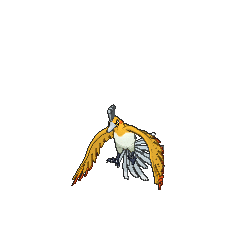 A wild Ho-Oh appeared in Ecruteak City in The Reawakening. It composes many pillars of fire to attack. 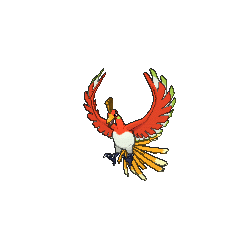 Ho-Oh has the highest Special Defense base stat of all Fire-type Pokémon and is tied with Lugia for the highest Special Defense base stat of all Flying-type Pokémon. Ho-Oh is tied with Reshiram for the highest base stat total of all Fire-type Pokémon. Ho-Oh and Lugia are the only two Legendary game mascots with counterparts that have not had a conflict in the anime. However, in the opening of The Johto Journeys, there is a brief scene of the two facing off in the sky, and the first preview for M13 featured the two fighting despite neither of them appearing in the movie. It is indirectly implied in a myth in Gold, Silver, Crystal, HeartGold, and SoulSilver that Ho-Oh revived Raikou, Entei, and Suicune. 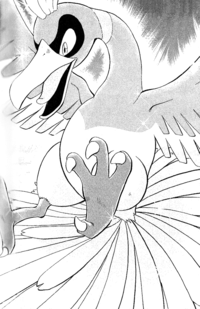 So far, Ho-Oh is the only Legendary Generation II Pokémon to have never appeared in any movie (only in introductions and as a disguise used by Mew). Ho-Oh's Hidden Ability Regenerator reflects a phoenix's ability to be reborn from its ashes. 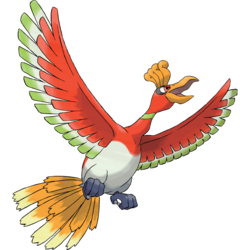 Ho-Oh may be based on the legend of the phoenix, specifically the Fenghuang, the immortal phoenix of China from which it derives its name. It may also based on the Huma bird, a Legendary bird that is said to never rest, living its entire life flying continuously, and resurrects itself and others in its own ashes and flames. It is a symbol of fortune and friendship and will bestow happiness to anyone who simply glimpses it. Many cultures view the Phoenix and Huma as symbols of resurrection; this is seen in Ho-Oh, which was reborn rising from its own ashes and had a hand in resurrecting Suicune, Raikou and Entei. It may also be based on many other firebirds; some examples are the three-legged bird, Simurgh, and the Ember Bird. It also is similar to the rainbow-feathered bird creature Achiyalabopa. 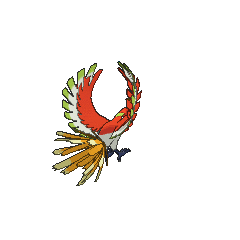 Ho-Oh and Houou are alternate transcriptions of 鳳凰 Hōō (phoenix), specifically the Chinese phoenix, Fènghuáng. The ou may also refer to 皇 ō (emperor) or 王 ō (king).